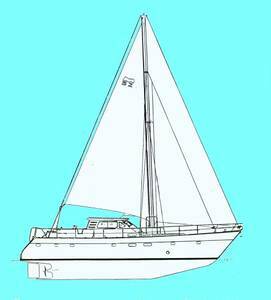 The MANDARIN 52 has evolved from an original 1979 Blaine Seeley design. The major changes which have been incorporated into the MANDARIN 52 include a completely new interior, much stronger scantlings, stronger pilothouse windows, a more modern shape to the pilothouse; a new transom with a large stern platform enclosed with safety rails; a small cabin trunk forward of the pilothouse which improves both the deck and the interior spaces below and the inclusion of many other innovative features. The traditional interior has a "V" berth cabin forward and a side bunk bed cabin to starboard. A popular option is a single forward stateroom with a queen sized double bed. The galley and the workshop are located port and starboard, aft of the main saloon, on either side of the engine/generator area. The stern is taken up by the massive aft cabin. Each area is described in some detail below. BOW AREA: A large anchor rope storage locker is located in the bow. This locker can easily take several hundred feet of 3/4" line and can be accessed through its aft bulkhead for maintenance or cleaning. The anchor chain, supplied, is stored in the bottom of this locker which has it's own bilge drain. FORWARD CABINS: A "V" berth cabin and a double bunk side cabin are standard in the traditional layout. Berths are a full 6 1/2' long. There are hanging lockers and drawers plus plenty of under bunk storage . An escape hatch and an opening ports for light and ventilation are provided in each cabin, backed by a forced and natural ventilation system. So that the occupants of the lower bunk will not feel ignored, there is another small round deadlight located near it. This little non-opening port may not sound like much but I can guarantee from experience that this little window to the world is an important addition to the pleasures of cruising. I was introduced to this idea while crewing on one of Bruce Bingham's great 36' "Fantasia" cutters where I was totally mesmerized by my private view of the sea as the little port alternately dipped under water and rose to show the waves. My private sunrise view of new anchorage's and harbors made sure I never envied the occupants of the large master stateroom aft. MAIN SALOON: The 10 by 15 foot main saloon has over 7 feet of headroom over most of its area, expansive floor space and a unique open layout giving a dimension of comfort seldom experienced, even in boats much larger than the MANDARIN 52. The port dinette has a table seating eight and two large hull ports for harbor viewing. The starboard side lounge area has a large settee and space for a complete entertainment center and a good size library. The lounge can easily make into a double berth and the dinette seat is a great sea-berth for one. GALLEY: The MANDARIN 52's galley is both spacious and practical. Over 10' long, and located away from the main traffic pattern, it offers a large double sink, gimbaled electric stove with oven and a large refrigerator and freezer, all standard. A space for an optional trash compactor or dishwasher is provided. Ample storage is augmented by extra storage in the workshop/storage room, provision boxes under the furniture throughout the boat, two very large provision bins under the main salon and the walk-in storage locker forward. In a seaway galley users can brace themselves well and they will appreciate the view and light from the large hull port. WORKSHOP/STORAGE AREA: It is difficult to adequately describe the workshop/storage room except to say it is an extension of the machinery spaces and one of the more practical features of this vessel. Imagine a place for a vice and tool storage, several secure storage containers for spares, a large bunk sized work bench and more. An interior feature like this on a 52' yacht must be seen to be believed. PILOTHOUSE: The pilothouse has a raised "U" shaped dinette to port with a table and a movable cushion which can be adjusted to make a great boxed in sea-berth. Across from this dinette is the helm area which seats two and has convenient space for cruising instrumentation. Behind the helm is a large chart table with two chart storage drawers and space below for an optional small refrigerator or ice maker. A delightful area for entertainment as well as a center of operations. MASTER STATEROOM: The master stateroom boosts an opening skylight over the queen size bed, 8 feet of hanging locker space, lots of drawers, 6 large 7x14 inch opening ports with screens, a desk with file drawer (or an optional heavily insulated 9 cubic foot freezer), and lots of table and book space. The large head has a full size tub. This is a luxurious stateroom rarely found in yachts less than 65 feet long. Imagine, 8 feet of hanging locker space! An optional "bedroom - den -office" aft cabin layout has the queen size bed moved to starboard, a large desk with a panoramic view through the transom and a settee to port. There are many other unique features of the MANDARIN 52 interior that I'm not able to describe in these short builder's notes. DOUBLE INTEGRITY PILOTHOUSE: Knowing a little bit about the power of the sea (I had to swim 4 1/2 miles to shore once) I have some reservations about large pilothouse windows that help make passage making so delightful. Consequently I have built a fully scuppered cockpit in the pilothouse. A standard storm board companionway entrance into the main salon combined with floor scuppers will restrict and drain any water which might find its way into the pilothouse. This second line of integrity, every bit as strong as the deck cockpit, is very important if one of the pilothouse windows should ever be broken. Three quarter inch plywood storm boards are available for the opening side windows. QUIETEST ENGINE EVER: One of the true pleasures of sailing is not hearing or feeling an engine. There will be times when it is desirable just to sail and the MANDARIN 52 will do that very well. There may be times when high speed motoring is called for and the MANDARIN 52 will also do this well, easily cruising at over ten knots. However in a motorsailer like the MANDARIN 52 many passages are made using both sails and engine. My goal is to isolate the engine so people aboard will notice little difference between motorsailing and the true sailing. Since conducted vibration accounts for over 50 percent of engine noise, and almost all vibration, the engine is soft mounted, using Lord lattice mounts, on its own set of stringers which are not connected to the vessel's main stringers. To make this system fully functional, the propeller has its own thrust bearing mounted in a floor timber and is connected to the engine through a splined double "U" joint sub-shaft. I coupled this design to a specially designed engine room to obtain the sound insulation desired. The engine room is double sound insulated. A special plywood construction with a sound deadening material as a core has a multi-density sound absorbing layer over the inside. All bulkheads and doors around the engine room are made using this technique. The generator is double vibration mounted. The result is that the MANDARIN 52 has one of the quietest engine installations ever developed for a production yacht. EASY TO USE BOOMLESS RIG: The furling mainsail on the Mandarin 52 is sheeted to an atwarthship spreader bar located between double backstays. This is an ideal rig for a motorsailer. The dangerous and often troublesome boom is eliminated and jibing is about as exciting as moving your handkerchief from one pocket to another. Furling and reefing are handled the same as the genoa. Because the lower stays to the spreader bar are vertical there is no need to "duck under" the back stays, a common inconvenience on traditional sailing rigs. Harkin furling and electric winches are standard making sail handling a breeze. In boom furling is available as an option. ADVANCED SHORE POWER SYSTEM: With today's technology I believe every motorsailer can have usable AC power at all times, when sailing, when anchored and without constantly running an engine driven generator. With a properly selected propeller there is plenty of reserve power for the main engine high output alternator to store energy for an interface power supply. Having refrigerator, freezer, galley, lights and entertainment center services available 24 hours a day is the difference between living onboard and riding onboard. I've done enough riding around the ocean and I'm really not interested in doing that anymore. A three thousand watt Victron inverter/charger and a large AGM house battery bank providing constant AC power are standard on the MANDARIN 52. And the Victron interface will charge the batteries when shore or generator power is available. COMFORTABLE SEATING (Finally): I'm tired of the uncomfortable seating built into most yachts these days. I know it is easier for the carpenter to make seat bases parallel to the floor rather than at the proper angle. I know seat back angles are often dictated by the nearest bulkhead. And I know that the "hi lo" dinette table makes a very questionable bed and results in seating about as comfortable as the courthouse steps. No more of this. The seating in the MANDARIN 52 has been designed by an architect for maximum comfort. No compromise has been made to squeeze out extra sleeping areas or extra inches of floor space. Experience the seats on the MANDARIN 52 and you may not want to get up - ever. SPECIAL BOTTOM CONSTRUCTION: Most cruising boats are built using heavy fore and aft stringers that are relatively short in height. The cabin soles are than built over floor beams which run across the boat from side to side. This system is difficult to make, not very strong and does not take advantage of the strength of modern boat building materials. The MANDARIN 52 has four, not the usual two, fore and aft stringers. These are made of strong Fiberglass "hat" sections reinforced with UDR caps and are tall enough to allow direct attachment of sole plates. The resulting honeycomb like structure gives superior strength and divides the bottom into many compartments. FloScan fuel monitoring, a fuel polishing system plus dual engine oil filters standard. Fuel fills and vents designed to make oil spilling almost impossible. Eleven deck storage areas including a dedicated liferaft locker in the cockpit, a cockpit cold box for drinks - and much more. If you feel a motorsailer may be part of your cruising plans please accept our invitation to check out the MANDARIN 52.